Here's how you can do it too. Let it be known to all that showing up to a BMW drive event tailored to fans and prospective customers in a Subaru BRZ is the equivalent of walking home at 9:37 AM with messy hair, baggy eyes, and last night’s going out clothes still on. Even though most people in attendance are enthusiasts and have respect for fun cars of all sorts, strolling through the parking lot in the tinny Subaru felt like doing the walk of shame. If you haven’t already gathered, this was my first brush with BMW’s Ultimate Driving Experience. For those who don't know, that's a six-city tour where fans and drivers from all backgrounds can come and experience the dynamics of the newest BMWs, eat some snacks, and race each other in G30 5 Series’ for lap times without having to shell out a penny. For a company that touts its commitment to driving pleasure, this is a hell of a way to back it up. Sitting in the 20 minute orientation where we were refreshed on the proper ways to manage oversteer and escape that hateful understeer, it became clear that this was no dealership test drive with training wheels. In an effort to remind the public that BMWs are great both on the autobahn and in the bends, BMW centered the event around a makeshift autocross course. It was made from cones and spare pavement on an expansive parking lot where I’d spend a few laps getting accustomed to the speed, honing my skills, and ironing out lap time-destroying kinks in my driving behavior before racing the other attendees. As one of the few millennials in attendance, I got into a new 540i with like peers and with tires howling, our test driver proceeded to leave us wide-eyed exemplifying what a perfect lap looks like. It wasn’t their skills or the fact that the almonds and M&Ms BMW fed me were now gurgling in my stomach that surprised most. 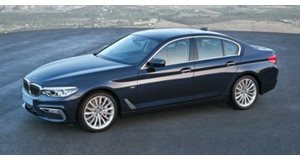 It was the sheer agility that the 5 Series, fully-loaded with passengers, possessed that left shock and awe in its wake. How could a 4,000-pound sedan filled to the brim with human flesh hustle around a track so quickly with only a 3.0-liter twin-turbo inline-six engine pushing 335 horsepower and 332 lb-ft of torque to the rear wheels (or all four wheels, BMW gave us bouts in the 540i and 540i xDrive)? BMW chalks it up to its engineering team’s experience with superior driving dynamics, and while the new 5er was the center of the activity’s focus, the future of our professional driving careers was at stake so we buckled up and raced each other for lap times. Each of us three passengers got two laps in the rear-wheel drive 540i and two in the AWD 540i xDrive. During each lap, our driving instructor pointed out how to lap the course faster by having us keep our eyes a few steps ahead in preparation for what was to come. Orange cones signaled where the car needed to be aimed while our teacher coached us on proper braking (trail the brake into the corners to keep weight, and in turn, traction, over the front axle) to help prevent understeer or make sure we weren’t chickening out and scrubbing too much speed before a corner. The entire point of the exercise outside of advertising the 5 Series, it seems, is to let the tires howl and screech in pain as they bear the brunt of the high-weight and high-G corners. To me, it was validation for to spending too much time translating “skills” learned on Forza to press cars like a true amateur. And translate I did. After our four practice lap, it was time for a fifth, this time with a stopwatch-bearing BMW worker keeping tabs on our time. Aggression shaves seconds off of lap times, but hit a cone and the two-second penalty is enough to remove anyone from a spot on the podium. Though one of my driving partners was more experienced with track work, his hardheaded pursuit of first place caused him to knock a cone over. Had the cone rule not been in place, second place would be his, first place going to a mysterious woman in her 70s who showed up and would have blown us away if she too hadn’t hit a cone. Perhaps it was my lack of sleep and coffee, but my mild manners on the track were good enough for second place with no cones down. First would have sent me to the finals where I’d race the best drivers from other groups driving that day. But it was getting late and thanks to clever BMW marketing, there was still more to do. Wandering back towards the refreshments tent, one runs into a line of brand new Bimmers waiting for test drives. BMW crosses its fingers that attendees emerge loyalists ready for purchase, so it puts everything, from the i3 and X4 M40i to the 6 Series Gran Coupe and M240i—all with keys inside—between the autocross track and the parking lot so test drives are encouraged. Liberty was taken here simply because it was a nice day out and why the hell not enjoy it by bombing a slew of fast and smooth Bimmers down a scenic road? Of course, the experience is highly encouraged. With only three events left, in Dallas, Chicago, and New York, it behooves you to register as soon as possible.